Oooh I have a treat for you this week... not one but TWO poems. Not mine though. Yesterday was mine and Jonny 2nd Wedding Anniversary. So I am going to share with you the readings we read to each other, after our vows, at our wedding. and feelings, secrets and dreams. to be willing to face changes in order to keep our relationship alive and exciting. with all I have to give and all I feel inside in the only way I know how. And I will be here. When the mirror tells us we're older. And tell you all the things you are to me. We'll be together and I will be here. To you and to the one who gave you to me. I hope you find these as beautiful and touching as we do. If you want to link up a poem, story, lyric, quote or prose to Wednesday Words, just grab my badge and link up below. Make sure you come back later and comment on some of the other bloggers who link their Wednesday Words, so we can keep this inspiring linky going. 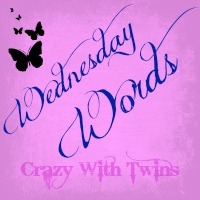 This entry was posted in Blog Hops / Memes / Linkies, Family, Poetry, Uncategorized, Wednesday Words and tagged #WednesdayWords, best literature, blogger linky, crazywithtwins, literature linky, lyrics, Poetry, prose, quotes, short stories, Wednesday words. Bookmark the permalink. Sarah MumofThree World recently posted..Happy 40th birthday! WallyMummy recently posted..Where are you going mummy? Distressed Housewife recently posted..Is Blogging Sadistic? Terribly soppy – but in just the right way. Congratulations on 2 years as a married couple! When I first read this, I was reduced to tears. When you both made those vows, you didn’t know what lay ahead. But you have both stood by them so beautifully – and you are among the bravest people I have met in the blogging community. Best wishes to you all for the days ahead!